Educating homeowners. Successful problem solving. Overcoming adversity. Contributing to the local community. Community management excellence. That’s what CCMC is all about! 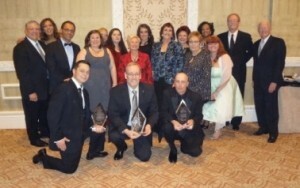 For these reasons, two CCMC communities were recently named best in their class by the Nevada Chapter of Community Associations Institute (CAI) at their annual CAI Nevada Chapter Gala Awards, held on Saturday, January 14, 2012 in Las Vegas. Siena was named Southern Nevada Outstanding Large Association of the Year for the second consecutive year. While Providence took home its first Southern Nevada Outstanding Master Association of the Year award. But the honors didn’t stop there! Dedicated to fostering vibrant, responsive, competent associations; CAI is committed to educating responsible leadership and achieving harmony in association living. The Nevada chapter currently serves more than 700 members; including business partners, community mangers and homeowner volunteers. It is one of the largest and most active of the 58 chapters across the nation.